Winter is beginning to subside. The snow and ice are melting away and all sorts of things are being unearthed — some terrifying. I’m talking about your bollards of course. And they look horrible. Everyone has been out and about enjoying the warmth, but they are also seeing some really nasty weather stricken bollards. Sure you are thinking, “Well I’ll just get someone out to paint that again,” just like every other year. But the fact of the matter is, between now and then, your business is looking shabby, and you are continually paying for product and labor just to keep up. I’m sure we have all heard the saying “Dress for the job you want, not the job you have.” This statement stands true for a lot more than just our personal appearance. I’m far more likely to feel confident about a bank handling my money that looks well maintained than one that has peeling paint and layers of rust. Sunlight and moisture can cause serious damage to bollards, and quickly. The more nicked and flaky they look, the less and less professional the establishment looks, leaving people less likely to trust the service you are providing them. Available in 10 standard colors, our vinyl bollard covers will help your bollards stand out in a good way. There are so many benefits to a good bollard cover that I find it difficult understanding why I ever see them without one. Not only does it quickly (and I mean quickly as it often takes about a minute for installation) enhance the aesthetic of your business, but it can also keep your company’s name looking good. Vinyl bollard covers are some of my favorite for the simple reason that they are durable. If one of your trucks comes into contact with a bollard, it easily results in scratches, and even dents. A vinyl cover adds surprisingly effective impact protection. No longer are your vehicles getting an unwanted makeover by a solid metal pole; instead, they now have a sturdy bit of cushion that can far better absorb blunt force impacts. No more scraped rusty bollards, and no more scraped rusty trucks. In the time that it takes you to tie your shoes, you can easily have eliminated years of maintenance, all while helping cement your place in your customer’s confidence. 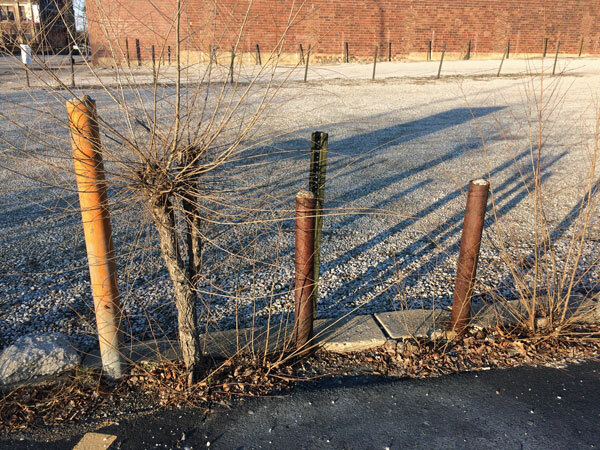 Your rusted bollards look horrible; it’s time to cover them up. This entry was posted in Bollards, Vinyl products and tagged bollard covers, bollard slips, bollards, seasonal maintence, vinyl bollard covers on April 3, 2017 by Derick.